In any of the Product views, a search box helps you find products quickly. You can search with a minimum of two characters, viewing results that match your string in the Product or Manufacturer columns. Click Products and open one of the views (Monitored, Discovered, Ignored, or All). In the Search box, type at least two characters and press Enter. The list contains any product or manufacturer with the string you entered. Select one or more list items and either click a toolbar button or right-click the items to act on them. You can drag the items to another view to move them. To see all products in the list again, click the X in the search box to clear the search. 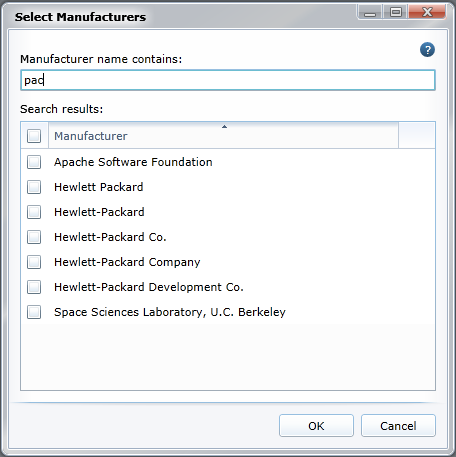 Filter a Product view's list by selecting a manufacturer, product, or computer group as a filter. You can use one or more of these filters to display a smaller number of products in a list. These filters are found in the column to the left of the product list. Select a manufacturer (or normalized manufacturer) to display only products that are associated with that manufacturer. Select a product (or normalized product) to display only products that match a product name. Select a computer group to display only the products that are installed on devices in that group. This is useful to find products when you know they are installed on a certain group of devices in your organization. In the column to the left of the list, click Select manufacturers. Type at least three characters in the manufacturer name box. Matching names are listed in the Search results box. Select the manufacturer names you want to use as filters, and then click OK. In the column to the left of the list, click Select products. Type at least three characters in the product name box. Matching names are listed in the Search results box. You can also specify strings to exclude from the search results. To do this, type one or more strings separated with a space in the Product name does not contain box. This can help you reduce the number of search results. Select the product names you want to use as filters, and then click OK. 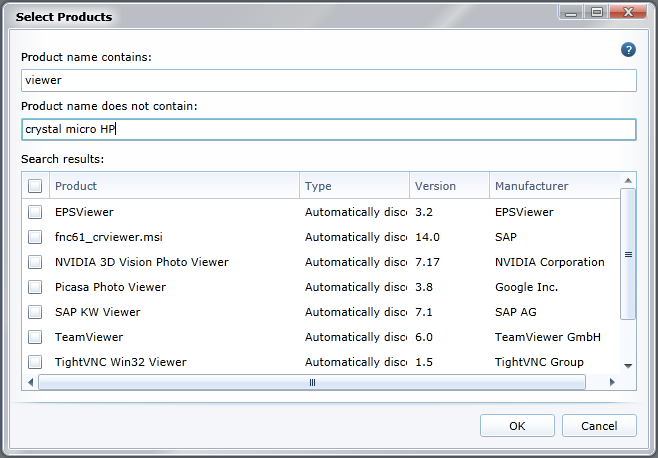 In the column to the left of the product list, click Computer group and select a computer group. The list changes to display only products installed on the devices in the group you selected. To remove the filter and view all products, click Reset.